October 20, 2018 – The BPRS presents What Doesn’t Kill You, a launch party for the brand new YA anthology featuring readings and live music. If you’ve ever felt like the world’s out to get you, then this night is for you! The party begins at 7:30 pm with WDKY contributors Tiffany Berryman, Matthue Roth, Abby Maguire, and two-time National Book Award Finalist Eliot Schrefer. Americana singer/songwriter Eli Bridges kicks off the musical portion of the night, followed by experimental pop/rock duo The Brooklyn Players Reading Society. The Brooklyn Players Reading Society explores the intersection between literature and rock-n-roll, channeling poet songwriters like Lou Reed, Tom Waits, and Laurie Anderson. Listen to them on Bandcamp. September 11, 2018 – The BPRS live with friends at Sunnyvale (1031 Grand St Brooklyn – map here)! Doors at 7:30. 21+. See yas! July 21, 2018 – The Brooklyn Players Reading Society is thrilled to return to Freddy’s Bar and Backroom (627 5th Ave – map here) after a long live hiatus. Please join us for some tunes, poetry, snacks, and drinks from 9 pm onward – we’ll be spreadin’ the good vibes all night long! Sept 9, 2017 – The BPRS unites once again with Americana folk rock band Sunshine Nights at SideWalk Cafe! Sunshine hits the stage at 9 pm and The BPRS at 10. No cover, $5 suggested donation, DJ after. Sidewalk has a two item minimum from their menu including delicious food and extensive drinks, both alcoholic and non. See you there! August 12, 2017 – OxenBrother! July 29, 2017 – The Brooklyn Players Reading Society live with Sunshine Nights @ Freddy’s Bar & Backroom, 8 pm! The BPRS brings our experimental pop rock to Freddy’s Bar and Backroom on Saturday, July 29th, at 8:30, followed by some bluesy, Americana rock with Sunshine Nights at 9:30. No cover! March 4, 2017 – The BPRS Presents “Home Grown” – An NYCLU Fundraiser at Sidewalk Cafe, $10+ suggested donation! All proceeds go to the NYCLU! Join us on Saturday, March 4th at Sidewalk Cafe (94 Avenue A) for a night of words and music featuring poet Terence Degnan, novelist Nora Fussner, poet Samantha Barrow, singer/songwriter John Santiago, rock/poetry duo The Brooklyn Players Reading Society (that’s us! ), and folk/country group Brotherhood of the Jug Band Blues. Literary door prizes, too! In light of the recent executive order telling refugees, immigrants, and even legal green card holding residents that America is no longer their home, the reading portion of the night will revolve around the question, “What is home?” We’ll also provide you with resources and ways to join the resistance so that you’ll leave ready to act. $10+ suggested donation – all proceeds go to the New York Civil Liberties Union! Please note that Sidewalk has a two item minimum (including delicious food, beer, wine, cocktails and non-alcoholic drinks). February 3, 2017 – MUTHA UP for Reproductive Rights, a live reading/fundraiser for Planned Parenthood NYC Action Fund, co-produced with MUTHA Magazine at Sidewalk Cafe in New York City on Friday, February 3rd! Door charge is $15 (and up!) suggested donation, and here’s your opportunity to kick off that recurring donation you’ve been meaning to do with a literary party. Make your donation right now by clicking here. Stories and poems and comics – projected on screen for live reading! – by MUTHA Magazine contributors, all about keeping it real with kids and keeping every person’s reproductive rights safe in this unprecedented time in our country. All proceeds go to Planned Parenthood NYC Action Fund! Line-up on the mic includes: Samantha Barrow, Emily Flake, Lauren Weinstein, Jade Sanchez-Ventura, Whit Taylor, Jessica Phillips Lorenz, Elizabeth Isadora Gold, myself, and other special guests. MC’d by MUTHA Magazine’s editor-in-chief, Meg Lemke. $15 (and up!) suggested donation for door charge, and here’s your opportunity to kick off that recurring donation you’ve been meaning to do with a literary party.Make your donation right now by clicking here. Food, Drinks, Friends, Stories, Comics, Activism! Sidewalk has a two-purchase minimum, but this can be satisfied with tea/drinks/etc, and they have super delicious food. October 1, 2016 – Mutha Tongue with LitCrawl NYC at Sidewalk Cafe! Mutha Magazine, Pen Parentis, and The Brooklyn Players Reading Society are teaming up to co-host an awesome LitCrawl NYC event this Saturday, October 1st at Sidewalk Cafe at 6pm. The line-up features diverse perspectives on keeping it real with kids, with readings by Emily Gould, Mira Jacob and Jade Sanchez-Ventura, and cartoonists Emily Flake Pastore and Lisa Lim screening comics live. This is your opportunity to get in on all the dirty secrets of muthahood you ever/never wanted to know. LitCrawl NYC is an annual event organized by PEN America and includes way more readings than just ours, all night long and all across the Lower East Side, FOR FREE. So, we’ll see you there. Please join us this Tuesday, March 29th, from 6:30-8 pm at Sidewalk Cafe for Mother Tongue, a night of words across genres and topics delivered by new mamas who are still committed to their art despite the little monsters sleeping under their beds. March 22, 2015 – The Brooklyn Players Reading Society live at Sidewalk Cafe with local performers Baer Berger and Meet the Patients. More details on the Facebook Event Page. Readin’ N Rhythm is extremely excited to return to Union Hall on Sunday, May 18th for A Tribute to the Everyday Things, a matinee show from 3-6 pm featuring award-winning writer Thomas E. Kennedy (Kerrigan in Copenhagen, In The Company of Angels), an incredibly smart, talented, and funny author gifted with an enchanting, musical reading style. He’ll be performing a track from his recent album, An Introduction, featuring dynamic interpretations of Danish writer Dan Turell’s poems set to music, along with some original poetry and fiction. Copies of his CD will be available for purchase. The amazing tenor saxophonist Igor Lumpert will also be performing with his band, America I Really Like Your Shoes. One of our favorite New York groups, jazz fusion greats Sweetpro, will close out the afternoon. For a taste of their style, check out an episode of Louis CK’s TV show Louie – that’s right, they’re his band. 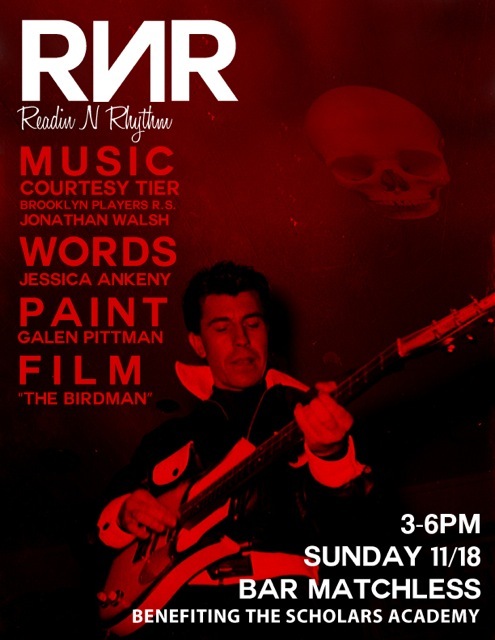 RnR house band The Brooklyn Players Reading Society will kick things off with a short set at 3 pm. $5 cover. Get your tickets in advance by clicking here. $5 cover. Get your tickets in advance by clicking here. Union Hall is located at 702 Union Street near the corner of 5th Avenue in Park Slope, Brooklyn. Click here for a map and directions. See you there! To remain up-to-date on all things Readin’ N Rhythm, find us on Facebook at Readin’ N Rhythm Productions and on Twitter @ReadinNRhythm. Readin’ N Rhythm Productions hosts a night of hip-shakin’, knee-jerkin’ rock-and-roll, THIS Saturday, April 6th at 8:30 pm at Union Hall (map). Prog pop trio Dirty Dog Work (feat. members of the Bicycle Boys) kicks things off at 9 pm, followed by Boston’s Muy Cansado (pictured), an upbeat trio known for their ”effervescent pop rock.” Twangy yet punky band the Yoni Gordon Orchestra follows with a jam-packed set complete with horns and mandolins. $7 cover, doors at 8:30. Come dance with us and celebrate the release of Muy Cansado’s brand new album, Let it Go, available for purchase here or day-of for $10. Please note, this is not a part of our regular concert series so don’t expect any creepy spoken word, crazy horn playing or strange poetry, just some straight-up good rock-and-roll. RnR’s sixth showcase promises some loud, rockin’ fun. House band The Brooklyn Players Reading Society will share their first completely original piece in their avant-garde, free rock style. Poet Jessica Ankeny will read some of her strange and beautiful words, followed by an acoustic set with jangle rocker John Walsh (of Self-Help). The hard rockin’, proggy duo The Courtesy Tier headlines. Visual Artist in Residence Galen Pittman will once again display his gorgeous oil sketches and oil paintings (like these awesome dogs! ), and will kick things off for us at 3 pm with a taste of his jazz rock. $5 suggested donation for the Scholars’ Academy, a middle school in the Rockaways still closed due to Sandy. RSVP at our Facebook Event Page! The crisp air of autumn is certainly blowing in the smell of campfires and charcoal and apple cider these days. We at Readin’ N Rhythm think your autumn air should be filled with great words and music, too. We’re psyched to be teaming up with Fairleigh Dickinson’s WAMFEST for the Move on Up Showcase on October 23rd, featuring Brooklyn greats Melissa Faliveno and the Yoni Gordon Orchestra, plus RnR House Band the Brooklyn Players Reading Society, alongside current FDU students. All of this madness will be emceed by the amazing and talented Wesley Stace/John Wesley Harding. The event is free but non-students are encouraged to RSVP by emailing wamfest@comcast.net. See ya there!